Today we would like to welcome back Grace Draven to the blog. We’re huge fans of Master of Crows which features an anti-social mage who is tempted to succumb to darkness but ends up falling in love with the woman who may save him. 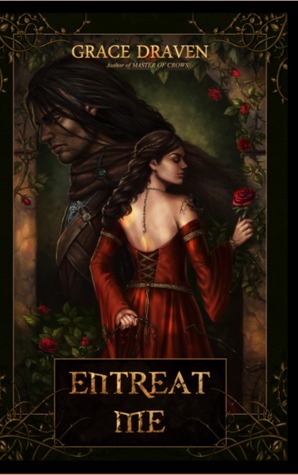 Her most recent book, Entreat Me, is a retelling of Beauty and The Beast and is out now. Bookpushers: Grace, thanks so much for allowing us to pick your brains. Firstly, congratulations on another wonderful release. Bookpushers: Why did you decide to write a Beauty and Beast retelling; what drew you to this particular fairy-tale? I love the framework of the story and all its renditions. It’s my all-time favorite fairytale. I think it represents the very best of humanity—hope and redemption, even in our darkest hours. I’m too cynical to think everyone or every action can be redeemed, but I’d like to think most can. That’s why the story appeals so much for me. I think all of us have facets of beauty and beast inside of us. The fairytale just personifies it. BookPushers: Ballard was so multi-faceted. He may have had the face of Beast but he was so level-headed at times and others very rawr, especially towards Louvaen. Do you find it more dificult to create a character that strays away from the usual archetype? Sometimes. It depends on the scene or the moment. On the other hand, the usual archetype doesn’t work for that scene or moment and straying is the way to go. I loved writing Ballard because he was a challenge. As much as I adore the volatile, razor-tongued Silhara, I didn’t want him to make a second appearance in another book under a different name. I wanted Ballard to be as strong and as tough, but that strength had to manifest in other ways—perseverance, powerful protective instinct, pragmatic patience. His character had to work with the heroine I paired him with as well, and I’d like to think this type of personality matched with someone like the iron-willed Louvaen. Parsing it out like this now, I’d say straying from archetype was the least of my worries. Bookpushers: Do you have anymore future fairy-tale retellings in the work? LOL. When I finished writing Master of Crows, I felt Silhara’s and Martise’s story was finished, and I think in the more epic scale of a novel-length story, it is. However, I wanted to continue writing in the world I’d created, and I admit I missed these two. I’ve started work on a short story sequel with Silhara and Martise as the central characters who will face an adversary I can’t wait to sit down and write. I can hear one of my editors now saying “Are you suuuuurrre this will be a short story?” She knows my writing habits very well. Entreat Me, at 123k words, was originally intended to be a 30k-word novella. I’ve paved freeways to Hell with my good intentions. I can only say I plan to publish this short story this year. I’m afraid if I gave a more concrete date, I’d be right back here with many apologies and excuses as to why I’ve had to delay for the 13th time. I do have a title—The Brush of Black Wings. Bookpushers: Romance (yay) is a strong core in all of your fantasy books. Do have any plans or desires to write outside of a traditional fantasy setting? I have a short story I’m contributing toward a group project. I can’t say anything more about the project itself just yet, but my story is a contemporary romance. Because there are no fantasy elements that usually appear in a Grace Draven book, I’m writing it under the pen name Annabeth DenBoer. Every other project though is strictly fantasy romance. It’s the subgenre I think I write best in and one I enjoy the most. Bookpushers: Your worldbuilding is always so in-depth and the imagery is so vivid. How do you plan and build your worlds? I used to play a lot of D&D when I was in college. Everything I ever learned and currently apply to my world building techniques I learned from the cleverest, most imaginative, diabolical dungeon master who ever lived—my brother Rick. He ran his games with two principals: 1) ground the fantastic in the mundane so that it becomes unexpected and 2) everything has a price. Once Upon A Time’s Rumplestiltskin doesn’t own that one. It’s the spine of a structured D&D game. I apply both those principals to my world building. In Master of Crows, Silhara of Neith is a powerful sorcerer, but those spells cost him something every time he casts them. Some cost more than others; some have backlash effects. Nothing is free. He also suffers from chronic bed hair, doesn’t do mornings and has a psychological issue with oranges. It all boils down to cost and ubiquity—two things every one of us is familiar with in our modern age. Bookpushers: What are some of your favourite romances to read? Even though I prefer to write almost exclusively in fantasy romance, I’ll read across genres. My favorites are older books. Mary Balogh’s The Pearl is still at the top of my list. I also loved The Faery Bride by Lisa Ann Verge and The Prince of Swords by Ann Stuart. Bookpushers: Unlike traditional fairytale romance tropes with the heroine (princess) waiting for the hero (prince) to rescue her, your heroines seem to be the rescuers for their tormented heroes. Why did you you decide to flip things around? I think that stems from personal observation. Except for one instance, every “rescue” event I’ve ever witnessed or been party to—be it physical, emotional, or mental—has been spearheaded or directly performed by a woman. That doesn’t mean all I’ve known are weak men. Far from it. I know a lot of courageous, admirable men (I’m married to one). I’m just hugely fortunate to know some incredibly powerful, amazing women too. Bookpushers: If there was a fantasy or an alternative world that you would love to live in which world would it be and what characters or people would you like to live and interact with? I’d love to live in Middle Earth’s Rivendell; however, I’d have Elric of Melniboné over for dinner and a chat. Bookpushers: If Entreat Me was a movie who would you cast for your primary characters? Richard Armitage and Claudia Black. No one can smolder or play tortured like Armitage, and Claudia Black is one of the most beautiful women on the planet. Thank you so much, BP! Always a pleasure and a privilege. And HUGE thanks to Grace – we have another giveaway of hers in the offering. You can win a copy of either Entreat Me or Master of Crows. To enter just comment below and the book you would like! The giveaway will end next Friday the 28th of February. Good Luck! Has is a voracious reader and a geek at heart! She is a fan of most sub-genres of romance and fantasy, but especially loves fantasy and some sci fi. She's currently looking out for historical romances with unusual settings, and fantasy romance, in the vein of Anne Bishop and Elizabeth Vaughan who are on her list of favourite authors. She's also a fan of authors such as Tamora Pierce, Patricia Briggs, Ilona Andrews, Ann Aguirre, Lisa Kleypas and Nalini Singh. She is always on the look out for new authors and loves the feeling of discovering a brand new author and books she loves. Great interview! I’d love a copy of Entreat Me. I am a sucker for Beauty and the Beast. These sound like a very interesting retelling. As I haven’t read Entreat Me, I would like that one if I’m lucky enough to win. Thanks for a great interview with a treasured and gifted author! Loved reading about her stories and characters from her perspective. I have both books so don’t need to enter a drawing. I just re-read MofC after reading Entreat Me and loved it more the second time around! I already own and love Master of Crows so I would love a copy of Entreat Me. Entreat me. Loved the interview. As a Master of Crows fan I just want to say that if the short story she is working on turns out to not be so short I am REALLY okay with that. I would like ENTREAT ME . I enjoyed MoC and am happy the author is not just renaming and transposing the protagonist from one story to another. both sound great, I’d pick entreat Me Thanks! I would love to win a copy of Entreat Me. Thanks for the book descriptions. It is the first time I heard of these books. Awesome interview 🙂 I haven’t read any of this author’s work but the books sound like great reads. I’m looking forward to reading them. I would love to win a copy of Master of Crows. congrats to Grace on the new release! I’ve been reading such accolades for this book, I’m dying to read it 😉 I would love a chance to read Entreat Me as I’ve just purchased Masters of Crows 😉 Thanks for sharing! I’ve read Entreat Me. OMG it was amazing! One of the best reads this year. It was one of the books where when you reach the end you want to read it all over again. Or wish that you hadn’t read it yet so that you can have the sublime experience all over again. I’d love a copy of Master of Crows please. Lovely interview ladies, thank you! 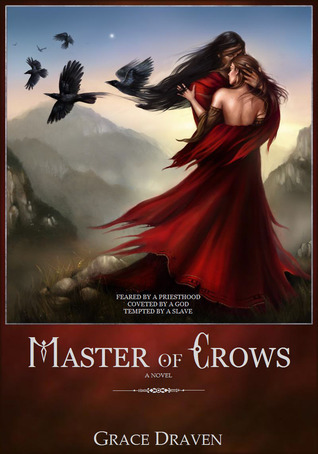 I would love to win a copy of Master of Crows, as it is no longer for sale at Bookdepository. If the giveaway’s open internationally, I’d like a copy of Master of Crows, since it’s no easily avaliable. This book sounds fantastic and the art work is beautiful as well. Enjoyed the interview! Love the story of Beauty and the Beast so would love to read Entreat Me. I would love a copy of Master of Crows. I’ve heard a lot of good things about it! Thanks for the interview. Grace Draven is a new-to-me author. I’d love either book to try, but since I have a weakness for the Beauty and the Beast fairy tale, I will choose Entreat Me. I’d be open to reading either book. Both books sound great. I would be happy with either one. Thanks! Well, I confess I haven’t read anything by Ms Draven, so I would like to be entered in the giveaway for Master of Crows. Thank you for hosting the giveaway! Just so fantastic. I’d love to read ENTREAT ME thank you. Balogh is my favorite author in romance as well! My fave is The Temporary Wife. I bought Master of Crows based on the reviews I read here and elsewhere, so I’d love a copy of Entreat Me. Thank you all for this contest! BTW, for those searching, I was able to purchase MOC at Smashwords. But you need to search on the title to find it. Welcome to The Book Pushers review blog. If you're an author, publicist, or publisher wanting to request a review, please see our Review Policy before contacting us. Thanks! If you want to learn a little bit about us, please head on over to the About page and our Reviewer Bios. We accept digital galleys/ARCs for review. Our preferred method of receiving e-galleys is through Netgalley, where we are a listed Review Organization Accepting NetGalley Titles. We also receive review copies through Edelweiss. Per the FTC regulations, please note that we do receive books for review for free by publishers, authors, publicists, and third parties such as Netgalley and Edelweiss. We also review books we purchase ourselves. For every book we review, we’ll grade them on our honest opinions. So if we don’t like a book, we’ll say so. If it’s a rocking good book, we’ll say so. Simples. We do use affiliate links such as Amazon Associates, Book Depository Affiliates, and the Barnes and Noble affiliated program. When you click on those links, we earn a very (and it’s very small) small percentage. Be sure to read our Giveaway Policy before entering any contest! When you click on the affiliate links below and order from them, we earn a very (and it’s very small) small percentage of the commission.